The following blog-post talks about 5 best eBook reader software for Windows 10. The rapid advancements in computing (and its associated technologies) have led to a digitization of a lot of things, books being one of them. So whether it’s a course book for the subject you’re taking up next semester, or your favorite mystery novel, or anything else, everything is available as digital files, called eBooks. And since just like any other file, reading an eBook also requires a special eBook reader software, it makes all the sense to have one installed on your PC, given how popular eBooks are. Right? Of course it is, and that’s why these are the applications that we’re going to talk about. These eBook reader programs not only support a number of electronic book formats, but also include features such as library management, customization, format conversion, and more. Let’s find out more about 5 best eBook reader software for Windows 10. Lightweight and easy to use, Icecream eBook Reader is the perfect solution for all your eBook reading and management needs. The application lets you add as many eBooks as you want to your eBook library. The added eBooks can be viewed either as a list (which displays information such as author name, reading progress etc. about them in separate columns), or as a visual bookshelf, and all you have to do is click on an eBook and get reading. Icecream eBook Reader supports different modes for day and night time reading, and you can tweak things like font size, alignment, and even add bookmarks. Apart from that, eBooks can be read full-screen, and you can also directly jump to any section via the content navigator. 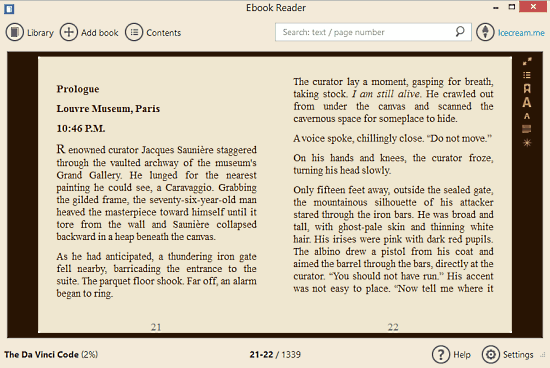 Icecream eBook Reader supports all popular eBook formats such as EPUB, MOBI, PRC, FB2, and PDF. Find out more here. It might seem a little strange including Sumatra PDF in this list, given the fact that it’s essentially a PDF reader software. However, there’s a lot more to it than just PDF documents. That’s because Sumatra PDF is a full blown eBook reader application that supports all popular eBook formats such as EPUB and MOBI. In addition to that, it can be used to read comic books as well. It’s extremely lightweight, and loads up even the largest eBooks super fast. The bookmarks and chapter marks are listed in the left pane, and can be used for quick navigation. Then there are features like multiple viewing modes, and the ability to directly send eBooks via email. Know more about it here. Although its simplistic UI might lead you into believing otherwise, make no mistake about it, FBReader is a powerhouse when it comes to reading and managing eBooks. Whether it’s EPUB or MOBI, FB2 or DJVU, this cross-platform application lets you read just about any format that you throw at it, and more. FBReader has robust library management features, and can automatically monitor specified library folder(s) for effortless organization of all your digital books. But that’s not all. The program lets you view the table of contents with one click, and the powerful text search can be used to find the content that you’re looking for in seconds. And yeah, there’s a bit of customization thrown into the mix as well, and you can tweak everything from font colors to page turning animations. Visit this link to know more. On the hunt for a simple eBook reader program that adds in a few extras as well? Take a look at FSS ePUB Reader. 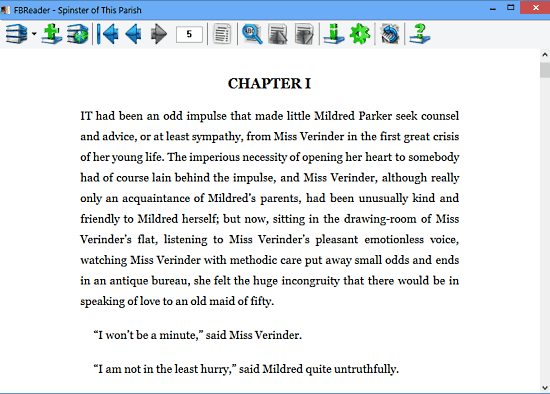 It’s a basic eBook reader utility that lets you read EPUB format books via a lean and uncluttered user interface. All you have to do is open up the eBook of your choice, and start doing your thing. 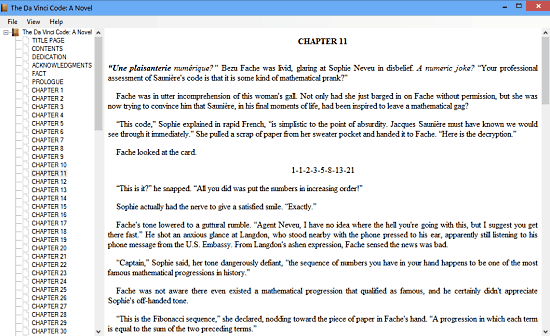 The chapter markers are displayed in the left pane, and you can directly click on one to jump to it. Text can be zoomed in/out as well. However, apart from all this, FSS ePUB Reader also lets you instantly convert eBooks into PDF documents. The converted books can be saved in HTML or TXT formats too. If you want an extremely bare-bones application for reading eBooks, EPUB File Reader just might be what you need. As its name pretty much gives it away, EPUB File reader only supports eBooks that are available in the EPUB file format. However, that shouldn’t be much of a problem, given that EPUB is the most popular eBook format out there. The straightforward UI of the application makes using it pretty easy; simply open up an EPUB format eBook, and it’ll be loaded up for reading. 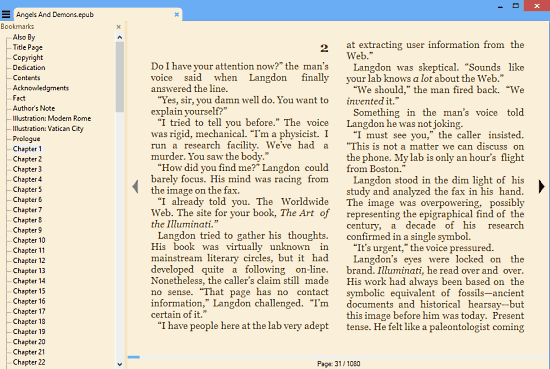 The left pane displays the chapters and bookmarks for quick navigation, and you can resize the reading window as you see fit. You can zoom in/out on individual pages, as well as save them in the HTML format. Whether you want a simple application for casual eBook reading, or a more feature loaded program that can take care of digital book library management as well, the software discussed above should come in really handy. Take them for a spin, and let me know your thoughts in the comments below.